PM Proclaims "Peace in our Time"
Neville Chamberlain stood on the runway waving a piece of paper, his agreement with Adolf Hitler for "Peace In Our Time". People believed it then, so we got a shock when war with Germany was declared the following year, in September 1939. Our village was never to be the same again. Obeying government instructions, we began to estimate our resources. The Memorial Hall was to become a temporary HQ for civilian administration, the distribution of gas masks, and later, ration books. Hyde Heath had its own Dad's Army. Men joined the Local Defence Volunteers, as they were called before becoming the Home Guard. Yes, they did drill on the common, armed with broomsticks, and a funny sight it was too. After a lot of mickey-taking real arms were eventually issued. Farm workers, food distributors, and the physically unfit were classed as being in reserved occupations. Flat feet got you out of the infantry. But if you wore glasses for weak eyesight you were put into the Observer Corps. Or so it was said. Trees were felled in Pipers Wood and other woodland in the Amersham area. Huts were erected to accommodate His Majesty's Armed Forces. At various times, Pipers Wood housed the Royal Bucks & Oxon Regiment, the King's Own Scottish Borderers, and the famous Highland Division. A WVS canteen opened in the Hall for those off duty. The village was overwhelmed with soldiers, but one could still safely cycle or walk to and from Hyde Heath without being molested. There would be a few wolf whistles, which were found rather flattering. Dances were held regularly in the hall and in the sergeants' mess at the camp. The 51st Highlanders would entertain us with pipes and drums, and they nearly went through the floor when they performed the Sword Dance and the Highland Fling. They really were a wild bunch. Apart from all this entertainment, villagers were busy helping the war effort in many ways. The WI set up a jam-making unit in the kitchen of the hall. Some people say that it was the spoilt jam going down the drains that eventually blocked them, but, being wartime, it could have been other things. Home canning took place at the Wick (now Cedar Ridge). Here Dr Sybil Welsh set up the canning unit, and the whole thing was operated by my mother, with WI members helping during the busy fruit seasons. Most of the fruit for jam and canning was grown locally. The gardener and I picked plums from the Wick orchard until we were sick of the sight of them. Later the Germans must have heard (or mis heard) about this activity and launched a raid on the Hyde Heath Cannon Factory ! Queen Elizabeth now the Queen Mother visited Hyde Heath and other nearby villages in 1940, to see what was being produced on the Home front by the Wl. All the villagers turned out for her visit. It was a lovely day as the schoolchildren lined up to see her proceed down Brays Lane to the Wick . The village's Red Cross contingent were presented to Her Majesty. One of them, Mrs Frances Clark, still lived in Hyde Heath until she died recently. 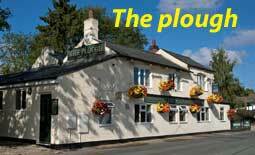 The Plough became another place of entertainment. Many an evening I would help Frank Morton pull the pints, especially when he had an attack of gout. Sometimes I would play the piano for a sing-song, not too expertly I fear, and would be relieved to find that some soldier could play much better. The village had a permanent searchlight post in Bullbaiters lane. The occupants were adopted by the villagers. My mother would billet their wives for a weekend, and I remained in contact with some of the wives for years afterwards. Hyde House was used as a temporary rest home for Sir Archibald MacIndoe's "Guinea Pigs". These were badly burned aircrew needing plastic surgery, and they came here between operations. Frank Morton advised me not to go to the Plough some evenings because some of these men were "not a pretty sight". I went all the same and was not bothered by what I saw. My sister Grace (who died recently) eventually joined the Women's Land Army, but at this time was an ARP volunteer. She was on duty the night a string of bombs were jettisoned onto the village, believed to be from a German plane aiming to destroy the searchlight post. This was our first experience of bombing. No houses took a direct hit, but the explosions blew out many doors and windows. Rumour said that six bombs were dropped but only five exploded. Despite a search the sixth was never found. In the months leading up to D-Day, Pipers Wood camp was full of Americans. Again the villagers made them welcome. I corresponded with the wife of one of the lads, in Newhaven Connecticut, and she sent me some nylons. They were the first pair I ever wore. I took them to show the girls at work and was the envy of all. I dared not actually wear them to work then, but of course they got worn eventually and I cried my eyes out when at last they wore out. I found the Americans very polite, and none of them put a foot wrong. One of our girls went to America as a G1 bride. After the Americans left, the camp was used for the rehabilitation of our returning prisoners of war. The WVS sewed flashes to their new uniforms and made what alterations were necessary so that they would look smart when returning to their regiments. I helped with this work, as I had certain sewing abilities. It was during this time that the "Stars In Battledress" show was put on at the camp. The WVS and their helpers including myself were invited. The stars I remember best were Max Bygraves and Terry-Thomas. Almost everything was rationed but in Hyde Heath we did pretty well. My mother got on well with the army cooks. She met them when working in the hall canteen, and she billeted service wives for weekends. So somehow we never seemed to go really short of food. During the lunch hour some of us would cycle to the British Restaurant in White Lion Road, Amersham, now the Amersham Common Village Hall. For fourpence I could get a fairly good meal. There was Woolton Pie, which seemed to have everything chucked into it, cheese flan, or scrambled dried egg on toast. It all went down well. The tea ration was eked out by adding a pinch of bicarbonate of soda to the pot, thus making the tea stronger. In many ways the war did the village some good. People here became more open-minded. After all, there was a world outside Hyde Heath ! Grateful thanks to Irma Dolphin for allowing these extracts from her book "Hyde Heath - Our Village"